Steber International has embarked on its most ambitious project to date – an 18.5m (61ft) fisheries research vessel for the Government of Mauritius. 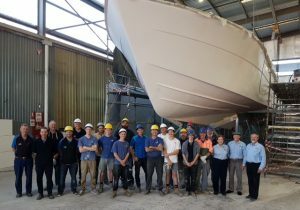 This is the largest vessel yet constructed by the Taree-based fibreglass boat manufacturer. So large in fact, with the fully enclosed flybridge, that the project will need to be finished on the water due to its size impacting on factory and transport configurations. The build has just reached a major milestone with the hull being released from the mould, allowing for further fitout to continue. “Several years ago we purchased the Westcoaster 53-58 ft and 58-65ft moulds, traditional cray fishing boats, that were originally built by Western Australia and South Australian interests”. The fisheries research vessel, with a length of 18.5m and beam of 5.4m will be powered by a single 500hp Yanmar diesel, producing a top speed of 13 knots. Build time is 18 months, allowing their government to spread funds over two financial years. The vessels have me port will be Port Louis, Mauritius. Large fuel and water tanks to allow the vessel to spend up to 30 days at sea in remote locations carrying out scientific studies. Steber International have been building commercial boats since the mid-1970s covering cray fishing, tuna, trap and drop lines as well as charter and government vessels. Currently Steber are building five 38ft support vessels for the Royal Australian Navy, to be delivered over the next two years. “We have built over 50 export vessels to date”, Mr Steber said, “and we are currently delivering a 52ftr to the Seychelles, the fourth vessel for this client. The Westcoaster design had to be upgraded to the new NSCV (National Standards for Commercial Vessels) controlled by the Australian Maritime Safety Authority (AMSA). Following this upgrade, extensions to our marine engineering department currently underway and staff recruitment, we are now seeking expressions of interest in the Steber commercial range, up to 65ft, as always custom built to client specifications”, Mr Steber concluded.